- Is the checkbox "Use device exclusively" enabled? If so, OpenMPT cannot output any sound if another application (such as your web browser) occupies the device. - Is another application using the device exclusively (via WASAPI or WaveRT)? If so, well, that application has exclusive access and OpenMPT cannot use the device. - Is the output format (number of channels and sample rate) compatible with the device? 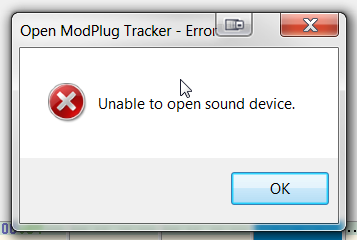 In particular enabling Quad output instead of Stereo can cause such an error.